Launched in Las Vegas at CES on Monday, the Linksys WRT1900AC combines its most successful router with new cutting-edge Wireless technology. The new Linksys WRT1900AC Dual Band Wi-Fi Router boasts the same retro blue/black design as its iconic predecessor, the WRT54G, but features more advanced hardware. The new WRT packs some of the most impressive specs on the wireless market and will be the world's first open source compatible router to support a dual core 1.2 Ghz processor, 4 removable and customized antennas, 128MB flash memory and an eSATA port. The new WRT1900AC ships with Linksys Smart Wi-Fi set-up and management tools and will be the first Linksys router to include the Network Map feature. Linksys has also been working with the OpenWRT community to make an open source firmware downloadable when the product is available. 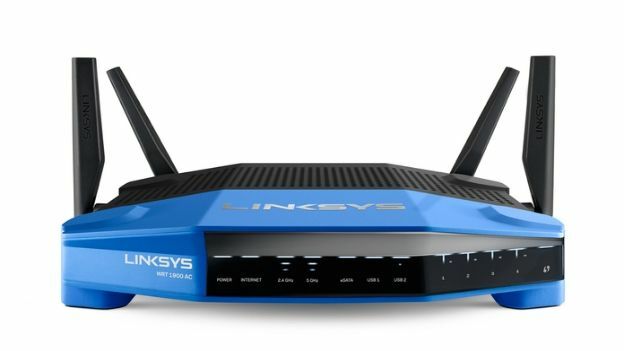 “Our new Linksys WRT1900AC Wireless Router will be the most powerful router in its class on the market. We have spared no technology expense to make this router a prosumers' dream,” said Mike Chen, product-management Vice President for Linksys. The WRT has the ability to support dozens of wireless products including laptops, tablets, smart phones, gaming consoles, media centers, hard drives, TVs, computers, printers and the dozens of connected devices still coming to market. The new Linksys WRT1900AC wireless router was unveiled this week at CES with a planned release date this spring at leading online and retail stores. If you're thinking of getting a wireless router this year, then check out our feature on the best wireless routers to buy in 2014.